I played Grandia II 7-8 years ago. It was recommended to me by our forum user Edouble, and quickly became one of my favourite games of all time. 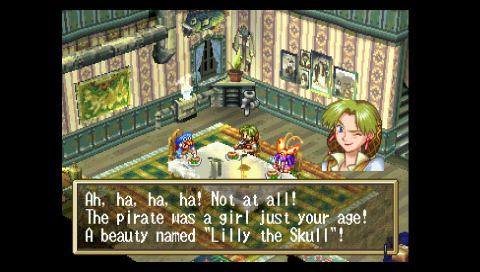 With a really cool protagonist in Ryudo, a great sidekick in Skye, adorable Dreamcast graphics that remind you of Final Fantasy VII (but models are considerably more complex), not one, not two, but three great female characters in Elena, Millenia and Tio, and a relatively thought-provoking story, Grandia II already had all the goods to be one of the best RPGs of all time. And then, the battle system! Tactical RPGs aside, since they’re a different genre, it happened to be the best battle systems in an RPG I’ve played (and I’ve played quite a few…). 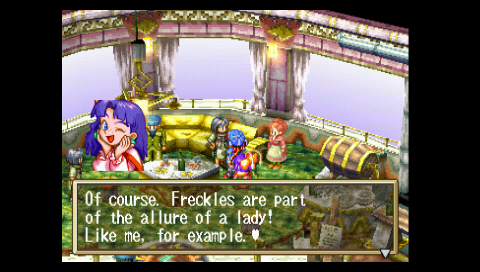 So yes, it was easy for Grandia II to win my heart. 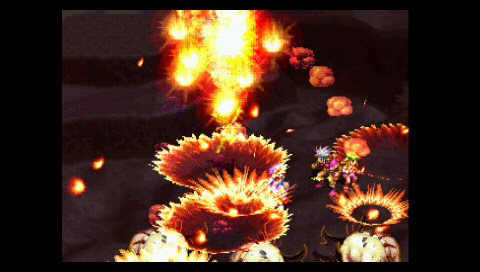 Much later, my backlog finally rolled to its predecessor, the PS1 version of Grandia. I knew that’s where that amazing battle system’s roots lied, but would the rest match up? I was looking forward to finding out. 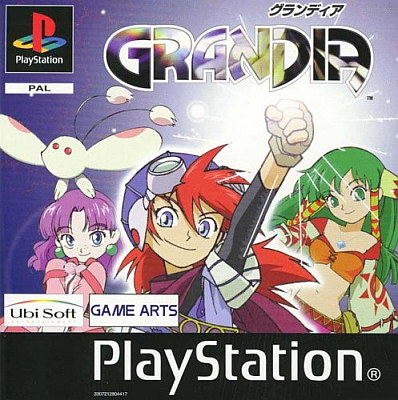 Grandia actually came out on the Saturn almost 2 years earlier than on PlayStation, but it’s no surprise the latter version gained more popularity. Game Arts, makers of the astonishing Lunar games, outdid themselves with the battle system in this one, managing to make a fast-paced system where every action matters, and you are encouraged to experiment with different attacks. As for the story and characters, well, in this aspect, I have to say this is easily the weakest Game Arts game I’ve played, but that is not to say that it is bad by any means. Just not anything particularly extraordinary by JRPG standards. As a whole, the game is really fun, and the battle system makes it well worth playing, but the PS1 offers several other JRPGs that clearly surpass it, including the remakes of Game Arts’s own Lunar games. The screenshots in the review have been taken by me. 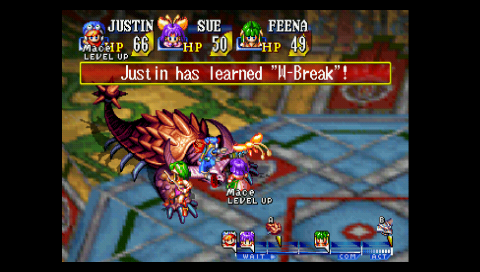 The story in Grandia revolves around the protagonist, a kid named Justin, and his dream of becoming an adventurer. Predicated by his genes, his mother and father both having adventured quite a bit in their youth, Justin knows that life cannot be any other way for him. In result, his childhood is mostly playing pranks on the citizens of Parm, his hometown, and rivalries with other kids. Early in the game, we get to experience some of Justin’s everyday routine in Parm, and it’s also one of the highest points of the game, juvenile as it is. Occasional hilarity is to be had in conversations about “coffee” – clearly, the US-safe replacement of alcohol in the Japanese version. Of course, soon enough, Justin and his younger friend Sue stumble upon an ancient mystery, which only motivates them further to go on a big adventure. They learn of an advanced ancient civilisation preceding their own, and are eager to unravel its mysteries. A military organisation has similar goals, and it is inevitable that our heroes cross paths with it. They are just children, but that is no factor when you have someone as determined as Justin. 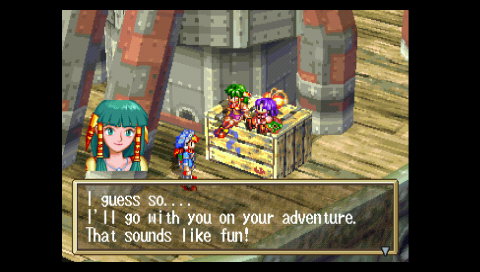 The story of Grandia is a story of youthful energy and hope that never dies. Justin is a kid barely starting his teenage years, but he has bravery and determination in huge excess. Sometimes, it’s almost like a hyperbole – he always believes in his success even when odds seem impossible. And, as things usually work in RPGs, he does succeed. He is good-hearted, he likes helping others, and rushes head-first into any situation where he feels he is needed. He is often reprimanded by his friends for this rather reckless attitude, but he is not one to change. This sounds incredibly generic, and it kind of is – he is a bit like Stahn of Tales of Destiny, except for being younger, and the “stupid country boy” part. But it’s also kind of adorable. Justin’s supporting cast is also likeable. We have the aforementioned Sue, who is like a little sister to Justin, being several years younger. She shares his passion for adventure, but is more sensible and often tries to steer Justin back on a safer path (and inevitably fails). Later on, the two meet the famous adventurer Feena, another great addition to the cast. Feena is older than Justin – in the supplementary materials, she’s only a year older, but she acts way more responsibly, and, in the game, where her age is never mentioned, she felt at least 4-5 years older than Justin to me. Like Justin and Sue, she is kind-hearted and has passion for adventure, although it is not until she meets Justin that she comes to understand her own true potential. The interactions between the three are really great. In the course of the story, Justin also meets other interesting characters like the fearless swordsman Gadwin who lives alone in the woods, living a life of constantly improving his skills. He is someone one can learn much from. Another character I really liked is the mysterious Guido, a rabbit-like creature with inexplicable, almost supernatural foresight. Then there is the powerful Liete, and the coarse Rapp who forms a fun rivalry with Justin. As a whole, all the major characters Justin meets are interesting. The same cannot be said of the game’s villains, who are quite crappy and generic. To add insult to injury, there is no decent explanation about why they are evil and seek destruction. 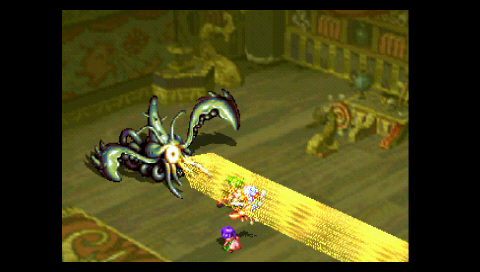 As outlined in the intro, Grandia’s huge gameplay advantage lies in the battle system. 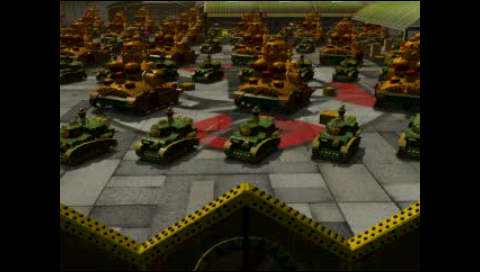 Depending on their speed, characters and enemies are placed on a line designating the turn order, being given commands when they reach the “Com” zone, and acting when they reach the “Act” zone. But every action taken makes a difference about the length of time until the next one. For example, defending, aside from reducing damage, means you’ll act much faster for your next turn. Spells that you are less skilled with, as well as more powerful ones, take longer to cast… It’s truly a joy. And there’s more – the position of characters in relation to enemies also matters. For example, if you are far away, an enemy’s mid-range attack will not harm you. You can change your position during the battle. If someone is hit, they also get slowed down. It’s even possible to cancel an enemy’s move if you attack at the right moment. 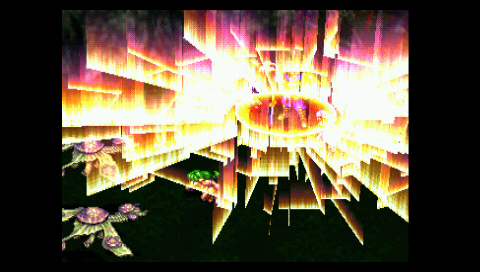 Aside from battling, Grandia is a pretty standard early 3D JRPG. In towns/locations, you can run around, enter buildings, talk to people, etc. You can rotate the camera in most locations, but in some it’s restricted. Importantly, there are no random battles – you can always see your enemies on the screen, and it’s usually possible to avoid them! Well, sometimes they ambush you from hidden places, but that is not unrealistic. Despite being a huge RPG fan, I dislike random battles, and it’s always a pleasure to play a game without them. One downside is that the world map allows you only to choose between locations, there is no big world map to run around on like in PS1 Final Fantasy games. One of the most interesting parts about the game is learning new abilities and spells. There are four elements in the game – fire, earth, water, and wind. Some characters already know one or more of them when you first meet them, but the rest you’ll have to master yourself. Learning how to control an element’s power is actually purchased at shops… But not with money. 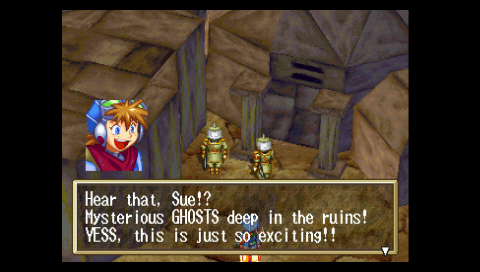 You need the special “Mana Eggs”, and only a dozen or so of them exist in the whole world of Grandia. You will be finding them gradually in dungeons, and they provide great incentive to explore. If you have, for example, fire powers, you will be able to use fire spells. As you use them, fire-specific experience is gained, and eventually new, more powerful fire spells are unlocked. If you unlock another element for that fire-using character, for example wind, you will be able to not only also use wind spells, but also the combination of fire and wind – thunder! 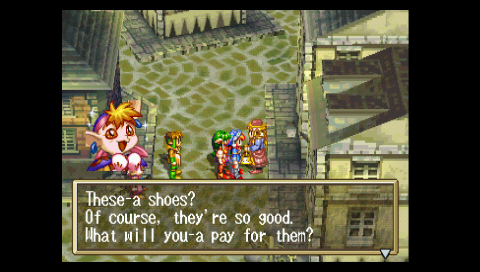 That is a very neat perk in Grandia, and makes battling and gaining experience much more meaningful. There are also three levels of magic with MP separate for each level. Of course, the higher the level, the more powerful the spell. Special attack skills are gained in a slightly less engaging way. 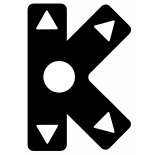 Each character can wield several kinds of weapons. For Justin, it’s the sword, the axe, and the mace. Doing regular and special attacks with a sword increases the sword-specific experience, and allows you to learn sword-specific special skills. There are no combinations, but some attack skills require certain proficiency with two or three kinds of weapons before they can be unlocked. As a whole, it’s probably possible to go through the game mostly bashing enemies with weapons, but it’s much more fun to diversify your arsenal with different magic. 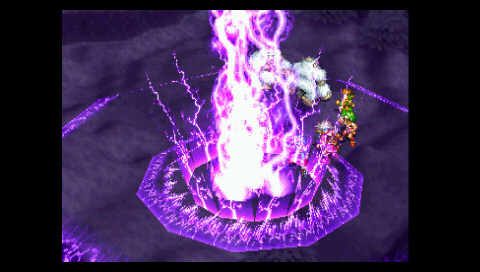 Boss battles somehow always manage to feel epic, even when they aren’t particularly difficult. There are, of course, several exceptions, and I did get a few game overs, but even the hardest battles can be conquered neatly if you use good tactics. It’s extremely important to harass your enemy as much as possible, not allowing them to attack often. The final battles are appropriately the most difficult ones, and require quick thinking. As a whole, the game’s difficulty is on the easy side. Occasionally, there are also puzzles to be solved so you can advance in dungeons, but nothing beyond the difficulty of your average Zelda puzzle, for instance. 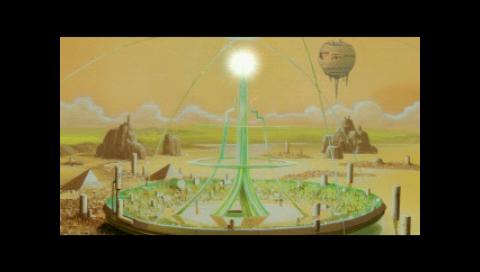 Grandia’s world is very interesting and well-designed. There are so many different locations, each with its own unique style and characteristics. Sometimes, you’ll see even relatively closely positioned villages be completely different, due to the nature of the people inhabiting them. 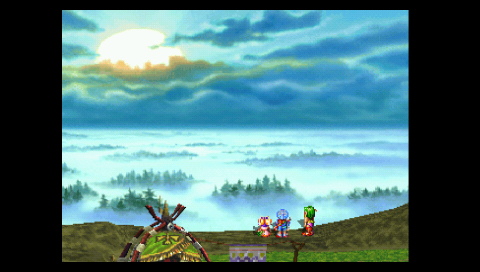 No two towns in Grandia look close, and that is a pretty strong asset of the game. There are lots of beautiful environments. Dungeons aren’t nearly as engaging, unfortunately, their design is, as a whole, rather dull. But I guess you can’t have it all. Character models are as good as the hardware allows, but the portraits are beautiful. The main characters have lots of different portraits conveying many emotions, appearing when appropriate in the dialogue. Magic and special attack animation is cool. Grandia’s soundtrack by Noriyuki Iwadare has several catchy tunes, but there is barely anything I’d listen to outside of the game. Still, the game is notable for the really minimalistic tunes in some dungeons, which work surprisingly well. They contain only a repeating beat, but are usually fast-paced and pump you up to finish up faster. The song I chose sounds in the Misty Forest and the Luc Village, being named after the latter. 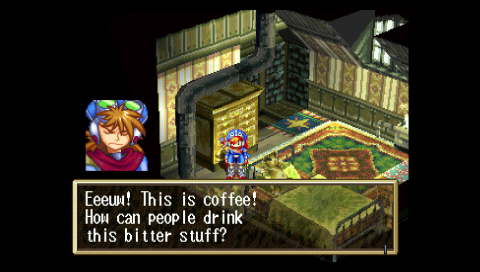 Grandia is one of many excellent PlayStation RPGs. It’s certainly not among the very best, and it pales in comparison to its predecessor, but it’s still a really fun game. 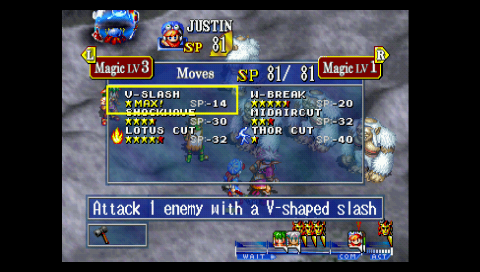 The main merit of Grandia is the fast-paced and incredibly original battle system. Adding to it the fascinating magic and skill system, and the entertaining character dialogue, it’s more or less a guarantee you’ll enjoy the game as a whole. The story is rather shallow, and the villains are generic and well below the standards Game Arts set with Lunar, but the world is worth exploring with its many different locations. If you’re an RPG fan, Grandia is well worth playing, even if it’s not a must.